9o0gle.com is a search engine that should work on the main browsers and might be spread with bundled installers on unreliable web pages. There is not much information about the program, but based on its behavior our specialists categorized it as a browser hijacker. It means that the application could replace default homepage with 9o0gle.com. Our researchers would also like to inform all users that the search engine might display modified results, which could include potentially harmful content. If you accidentally installed it on the browser, we advise you to get rid of it. This is why we prepared a step by step removal guide that is available at the end of the text. If you keep reading the article, we will explain to you how the software could be dangerous to the computer. The browser hijacker might travel bundled with other suspicious software, such as adware, potentially unwanted programs, suspicious toolbars, and other. Users could download such installers from homepages of particular applications or file-sharing web pages. To avoid software as 9o0gle.com in the future, users should stay away from unreliable file-sharing websites. Plus, it would be better to find out more about a program before you install it. For instance, you could read some reviews about it or learn who published it. The application might hijack the Internet Explorer, Google Chrome, or Mozilla Firefox browsers. The hijacker could switch your default homepage with 9o0gle.com. At first, the site might not raise any suspicion as it provides “Google” search box in the middle and a few links to web pages of social media, e-shops, online gaming sites, etc. However, using the provided Google custom search could be not the same as searching on google.com. We tested the application and learned that 9o0gle.com could display modified search results. Apparently, it may place third-party advertising that might appear in a form of pop-ups, sponsored links, and so on. The ads might come from the software’s third-party partners’ web pages. Unfortunately, some of the websites could be harmful to the system and as you click the ads, you might be redirected to such sites too. Even though we cannot be one hundred percent sure if any of this might happen to you, there is such a possibility, and you should be aware of it. If you do not want to wait till something bad happens, you could remove the browser hijacker from the system. The application should be eliminated if you reset the affected browser. There is no need to worry if you do not know how to do that because we are adding removal instructions below. 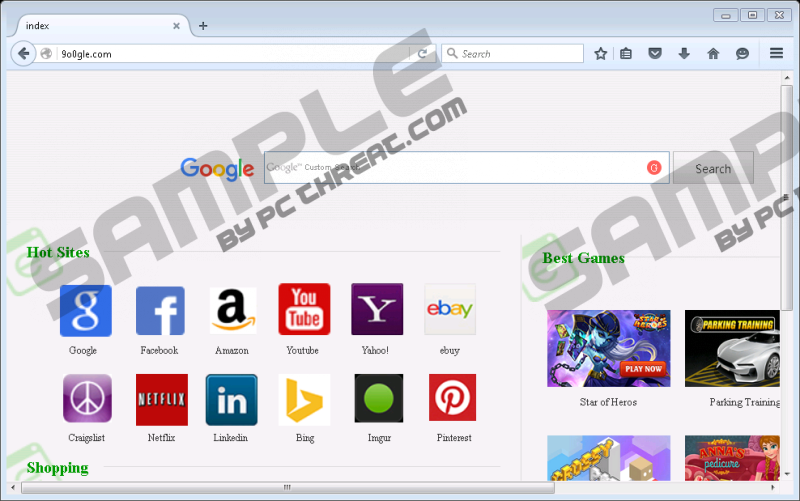 In fact, there is one more way to erase the browser hijacker. Users could download a trustworthy security tool, perform a full system scan and delete the application automatically. Also, in case you need any assistance, we want to remind you that you can always contact us via social media. Press Alt+X and choose Internet Options. Choose Delete personal settings and click Reset again. Press the Help icon and click on Troubleshooting information. Select Refresh Firefox once and then press Refresh Firefox again. Slide below and click Show advanced settings. Slide below again, press Reset Settings, and click Reset. Quick & tested solution for 9o0gle.com removal.